Tips from Succussful New Americans! This past week I have had the privilege of being exposed to some highly motivated and inspirational people through my work at Accent Master. These people mostly immigrants, often here on HB-1 visas or students, have come to the playing field that was quite uneven for them. The field was full of people for whom English was their first language, who had connections and degrees from Universities much more familiar to Americans. These ESL clients have prospered financially as well as personally. The lessons that have been imparted to me are undeniable as they have gone through my courses and here I will attempt to share them with you. 1. Nothing is impossible: This first step seems to be an attitude and a mindset that collectively they have been able to hold steadfastly through the good times and bad. 2. Don't just work hard, but word smart: It is the past or old way of thinking that tells us to have more money we must work more hours. However there are only so many hours in a day. So it is important to work on things that give you real return. 3. Don't just run around, use your time! : These same people come to my class and invest in themselves. When they have presentations they don't just wing it they develop it to perfection, same with interviews and leadership. For example one accent reduction client that I work with is an MD, who is finishing his residency at a very well respected NY hospital. He has interviews coming up and he is not just resting on his impressive resume but spending no less than 6 hours with me practicing any question they may pose to him. How do you think he will do? 4. Clarity: Set goals and check up on them every 6 months. Keep yourself on track. Don't let your time slip away in front of a TV watching other people have a life! Do something. It's 9PM are you watching some crazy reality show or are you taking an engaging and fun class on your computer with Lynn at Accent Master? Which would be a better use of your most precious resource...time? 5.Visualize: Paint a clear and vivid picture of you in success. What does success mean to you? Financial freedom? Power? Better relationships? Create a good visual image of the life you want and work toward this. 6. Network. They say you are the sum of the 5 people you spend the most time with in your life. So go out and cultivate friendships with successful and happy people. Bring positiveness into your life and develop the habit of creating positive energy around you. Because that is what it is a habit to be negative and create negative energy or to be positive and create the positive energy. 7.Ready-fire-aim! Okay do you think it should be ready aim fire? So did I, but know a recent University study say not true. Get a good idea, execute the idea and then adjust (or aim better) once you have executed the idea. Think in this new way. Put another way: Be bold! 8. Create a positive mantra: When negative self-talk threatens to take over your thoughts have a positive saying or expression that speaks to you ready to fight back! Instead of "I can't wait until this is over" Say to yourself " I will be proud of myself when I get this done!" Our mind believes that our thoughts are reality so feed it a reality that empowers you not reduces you! These are just a few gems that maybe we know already but always bears repeating! I hope you enjoyed reading these and enjoy even more putting them into action! As the new year approaches it is a time to reflect on what went well in the past year and what did not. January first is traditionally a time to consider changing habits that are not working and begin new ones that will help us meet our full human potential. Committing to our best selves. It is usually not the one big thing that needs to get done. But smaller more chronic issues that undermine letting our best selves into the world. This is how I see English pronunciation. One the larger scale often people feel that their speech habits are not affecting them except in specific circumstances. However whenever someone gets into a conversation about how their speech impacts their lives, jobs and relationships it becomes clear that it is more then just a small issue. Maybe their speech does impact whether they can achieve certain promotions or even to land the job in the first place. Even if the promotion or job is only delayed how much did it cost in real dollars. Are you missing opportunities to network with colleagues or people in your neighborhood because you are being misunderstood. Do you not get your point across, give up or not volunteer information because the effort was just too great? Or perhaps leave an impression that was not truly reflective of you? How would it be different if you could truly communicate without this barrier? What freedom to be assured that who you are, and what you think was clearly getting across to your boss, to your kids teacher, to the group? This is possible, and it is possible to achieve this even with a foreign accent. Sound substitutions are not necessarily what is barring you from being misunderstood. So before you write off the idea of an American accent, feeling for whatever reason that you could not achieve this goal, it doesn't mean that you can't still much improve your communication in English! Look, you have come this far, achieved so much, take the final step into fluent and clear English communication. Call today and get started. The free lessons you are picking up on the internet help. There is no doubt, but nothing will substitute for the 1:1 class. Make real progress by committing to this goal in 2009. Call and set your voice free! Watch this short video from Accent Master to understand how to produce the letters of the American English alphabet. Put this into practice and you will save time when spelling out your name, address and other essential information, especially over the phone! . So why do I keep talking about standard reductions, such as contractions and reduced vowels? Because this is the way to make room for those pesky word endings and articles. Let's look at the article 'a'. This article can be linked to the word that comes before it. Helpful in respect that now you can end the word with a vowel sound. For example. You may say " Call a doctor." Now instead of having a final 'l' sound you can add the article 'a' and say "calla doctor." It is correct, you don't drop the article and you can avoid a final consonant. This is good because many languages do not use final consonant, all of their words end in vowels. 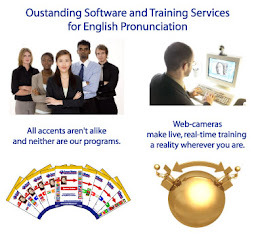 Many ESL speakers find final consonants challenging because of this. Even if your first language does use final consonants it probably does not use final voiced consonants. So linking the article 'a' or the word 'to' to the end of your words will help you avoid needing to produce that final voiced sound. If you have read my previous post on final voiced consonants then you are savvy to the importance of voicing the final consonant. However linking one of these two articles releases you from this challenge. You are probably aware that dropping articles causes incorrect grammar and additionally it can make you sound less fluent in English then you are. Not a good feature when trying to promote yourself at work. Try to link these articles to the previous word. Write down a few sentences or pick some out of the newspaper. Draw a line linking the article to the word before it. Record yourself reading the sentence using the linking. I know the first few times you record yourself, it can be strange to listen to, but you need to get comfortable with it! Recording and self-monitoring are key to learning a new accent!